When Moody Street’s beloved Tuscan Grill closed in 2013, an opportunity presented itself for someone to freshen up the intimate space and offer a new dining concept to Waltham. Enter Boston College graduate, Daniel Stokes who, after graduation, worked for a number of years at The Franklin Cafe in Boston’s South End before leaving the city to attend The French Culinary Institute in New York City. After completing his culinary training, Dan worked in a couple of New York restaurants including a neighborhood favorite, Harrison in Tribeca and later at the Italian restaurant, Pace, that led him to a move to Florence to study Italian cuisine. These experiences ultimately led him back to Boston and to the intimate space on Moody Street to fulfill his goal of opening his own neighborhood restaurant that would be warm and inviting and allow him to showcase his New American cuisine. 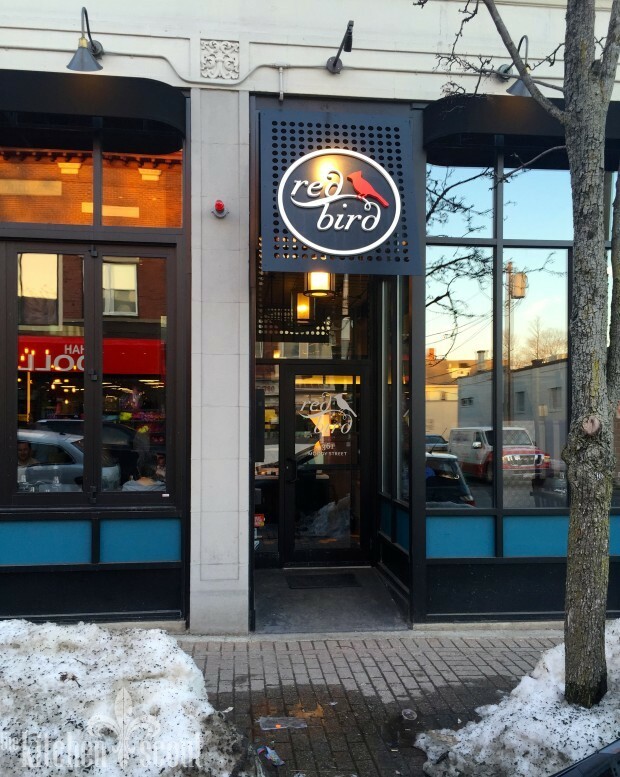 Red Bird took flight last fall and has been earning positive reviews since. My cousins Joan and Karen and I had been wanting to visit for some time and since there was a little less snow on the ground last week, we decided to give it a go. I arrived a little early which gave me the chance to sit at the bar, take some photos, chat with some people and take in the surroundings. 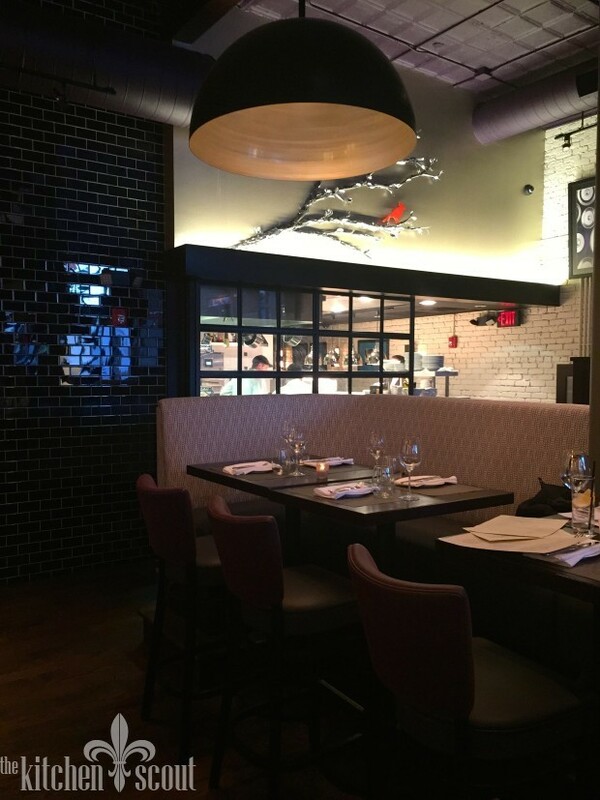 A small space, the restaurant channels the industrial chic vibe of many of the new eateries in Boston and its surroundings. 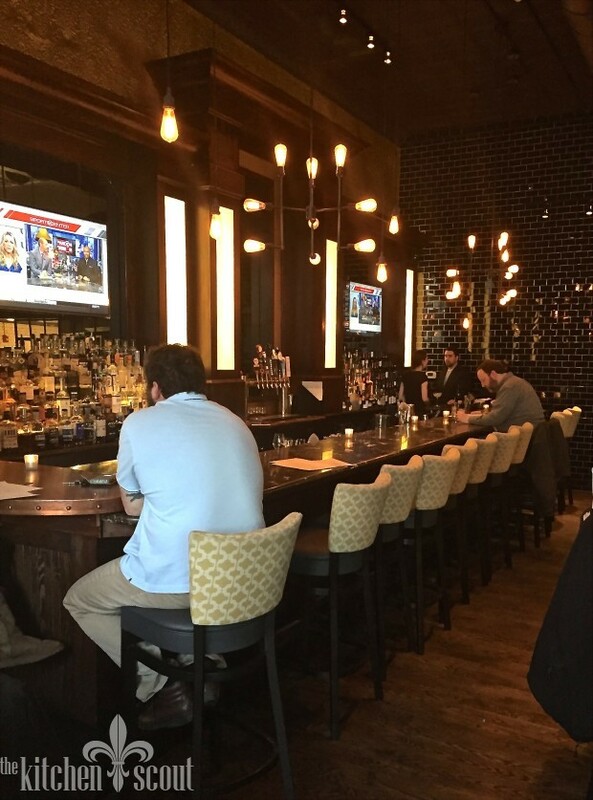 A large bar with two flat screens anchors one side of the space. Across from the bar are a few high top banquettes which separates the bar and dining areas. Traditional booths and a few tables complete the seating in this well lit restaurant. Loved the light fixtures above the bar. I decided to order a drink from Red Bird’s creative cocktail menu and settled on a “Bad Habit” which was the bartender’s favorite. 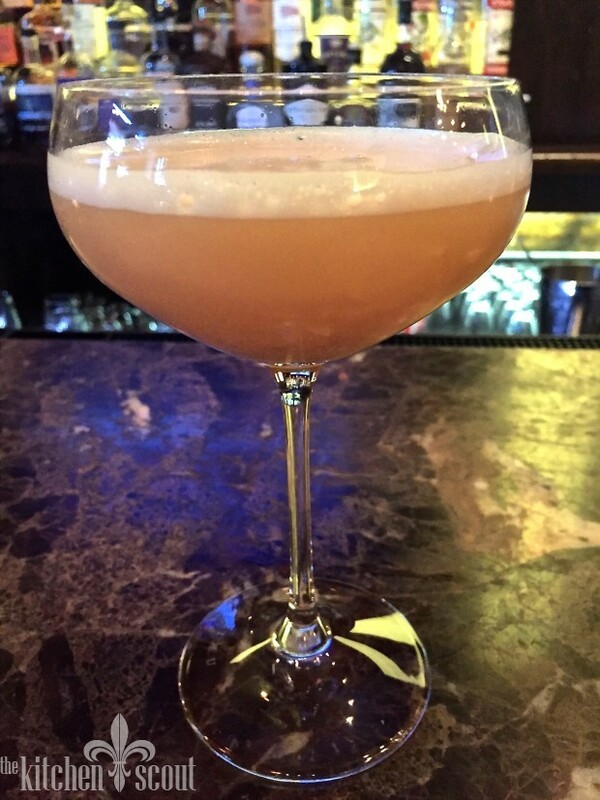 Made with Maker’s Mark Bourbon, an All Spice dram, lime, simple syrup and a whipped egg white, the Bad Habit is appropriately named as it was really delicious and could be habit forming! Neighbors on both sides of me ordered the Role Model, a gin based drink and a Sweater Puppies, made with Tequila. Both were very pleased with their choices. As the time approached 7:00, the bar was really starting to fill up (there are about 14 seats at the actual bar and maybe a dozen more at the banquettes). We were all a little surprised at how long it took us to get our respective drinks. There was only one bartender and at one point she left the bar to take an order from the banquette area. I flagged down the manager to finally pay my bill as my cousins had arrived and were waiting. This theme would continue throughout the meal as it turns out, but a second bartender would be helpful at a minimum. Nonetheless, I can imagine that this bar area is a very fun place to come with some friends and watch a game if you want or just have some cocktails. It felt like it could be a neighborhood favorite. Red Bird’s menu has something for everyone and they offer Gluten Free and Vegetarian menus as well. We ordered from the regular dinner menu which had Soups & Salads ($8-9), Appetizers ($12-14), Specialty Pastas ($20-21), Seafood ($21-28), Meats ($22-28), and Side dishes, all $6. The three of us shared two appetizers that I had read about in prior reviews. First up were the P.E.I. 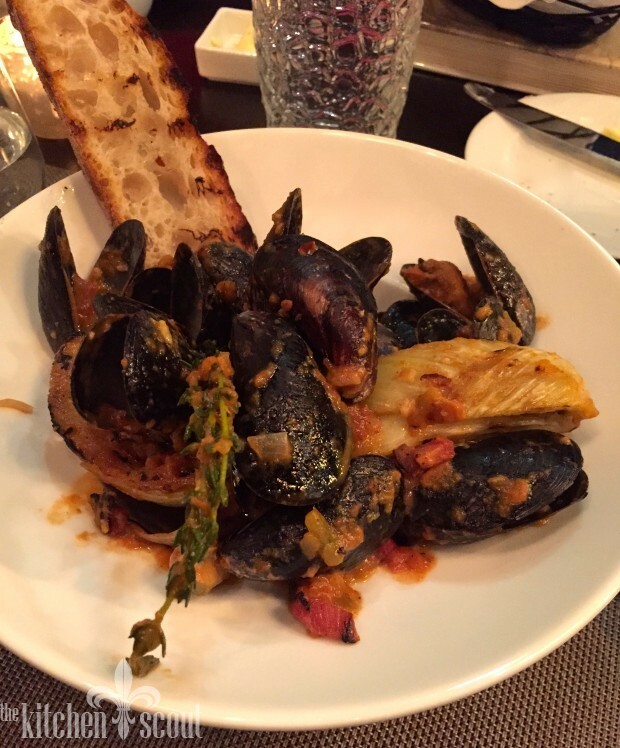 Mussels that were served in a smoked tomato broth with bacon, roasted fennel and crostini. We were curious about how they made the dish so the manager actually visited our table and explained that they smoke the tomatoes over a combination of woods, which then serve as the base of the wonderfully aromatic broth. The mussels were addictive. This dish was huge on flavor, the mussels were tender and the broth was worthy of sopping up with the crostini. 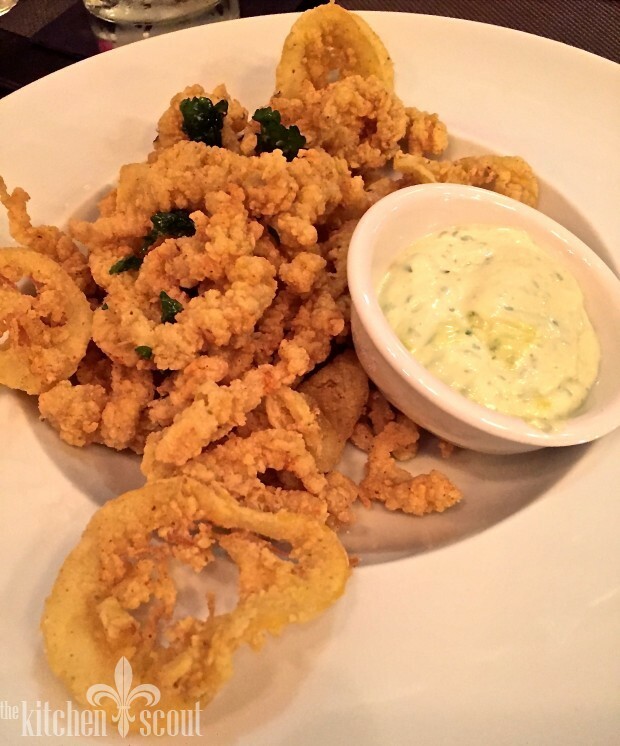 We also ordered the Fried New England Clam Strips that were served with a Coriander Aioli, Flash Fried Herbs and Lemon. Although these were not clam bellies as most New Englanders prefer, these strips were also incredibly delicious. They were perfectly fried and not greasy in the least. I would order them again in a heartbeat. Bread was also brought to the table accompanied by butter that had been flavored with honey and thyme. Delicious. 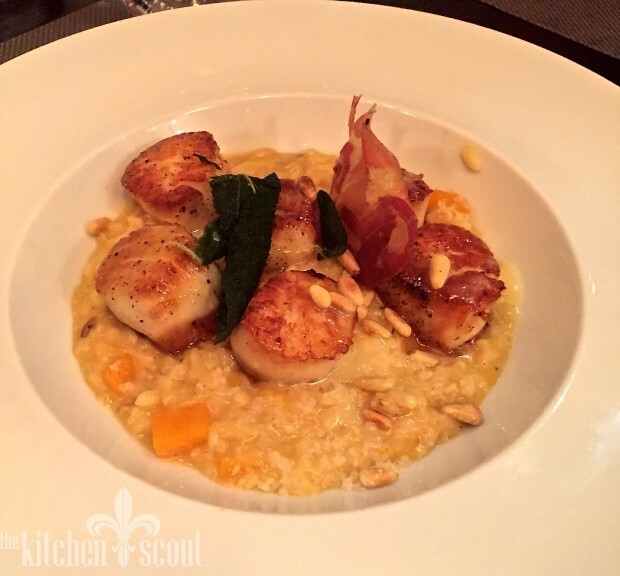 For dinner, Karen ordered Seared Scallops that were served with a butternut squash risotto accented with pine nuts, pancetta, crispy sage and Pecorino cheese. The scallops were perfectly seared and sat on a creamy bed of flavorful risotto. The pancetta added a little decadence and the the pine nuts added a little crunch to the dish. Karen thought it was fabulous. 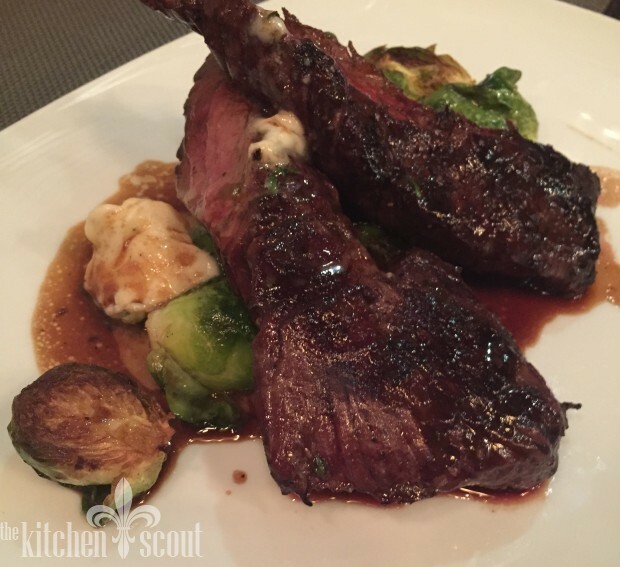 Joan ordered the Grilled Hanger Steak that was served with caramelized brussels sprouts and a bone marrow butter. The meat was cooked to order and was delicious. The caramelized sprouts provided a sweet contrast to the robust meat. This dish is also served with potatoes if you want. 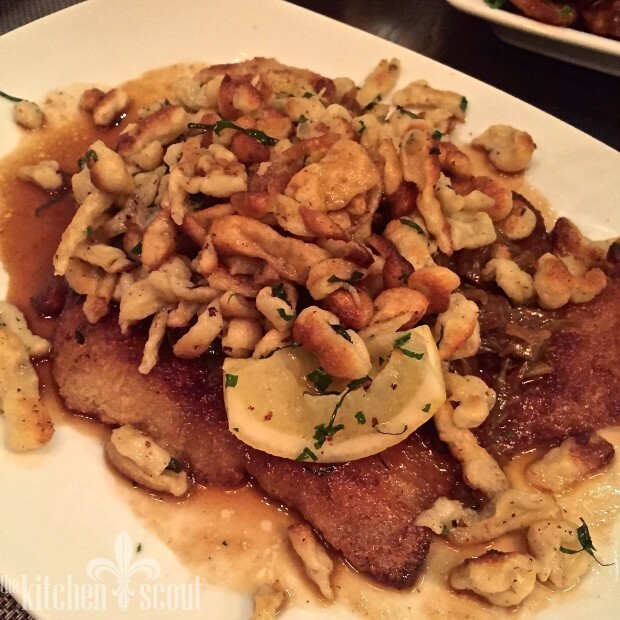 I ordered the Pork Loin Schnitzel that was served with bacon braised cabbage, spatzle and gravy. I had high hopes for this dish, and while it was very good, I thought the flavors were a little flat. It needed the lemon squeezed over the top and I think they might think about brightening up the gravy components to make the dish really sing. I had read about one of Red Bird’s side dishes in a review and wanted to make sure to order them since they were not part of my dish. 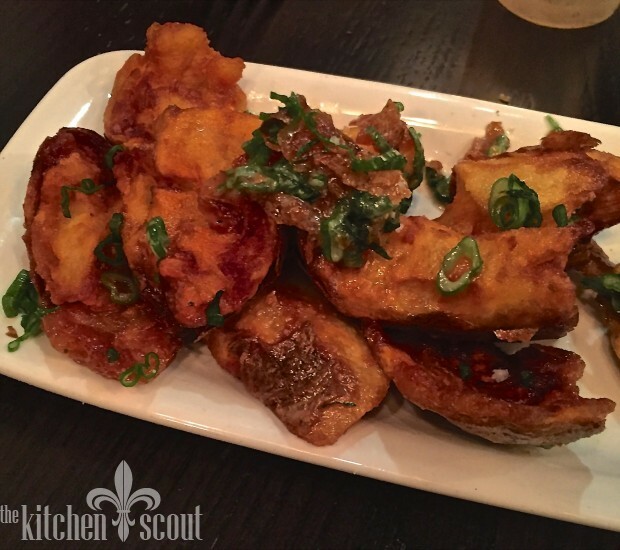 The Torn & Fried Potatoes are not to be missed! They were unbelievably scrumptious (not a word I use very often, but one that does these potatoes justice). The potatoes are baked, cut into pieces and then fried until crispy. Like old school “potato skins” but so much better! I think these could make a delicious appetizer at the bar if they added a dipping sauce. Hmmm. Dishes at Red Bird are complete with sides which I always think is nice because it takes the guesswork out of dining and generally is a better value for the diner. Red Bird’s dessert menu ($9-13) had lots of variety, but we were pretty full and passed on ordering. Choices ranged from a trio of sorbets to a maple flan, a chocolate sorbet, and a lime ginger frozen parfait among others. At the end of service, we were given a plate of the most delicious little treats, coconut cream truffles and blackberry pate de fruit. Small bites sending us off on a sweet note. Here’s how I would sum up our experience. While service was slow, both to get our drinks and to get our courses delivered to the table, we never felt rushed by the staff. The staff, including the manager and hostess were gracious and accommodating and our server was excellent. I walked by the kitchen at one point during the evening and saw two chefs working extremely hard at executing the beautiful dishes, which showed the heart that goes into the preparation and presentation. I would say that if you are in a rush or want a quick meal, this may not be the place to go unless you tell them you have a tight schedule. But when time allows, I highly recommend Red Bird as a fun and casual place to go have a delicious and reasonably priced meal in a comfortable setting. We stumbled upon Red Bird after dropping off my son at a summer camp at Bentley. My husband, younger son and I had a fantastic meal there. So much so, that when I picked up my older son from camp the follow Friday, I took him there for dinner. Again, a fantastic meal. So glad to hear this! Thanks for reading, Christian! Ha! Yes, Lucy it is me and thank you! I hope you have a great meal. Please tell them I sent you!